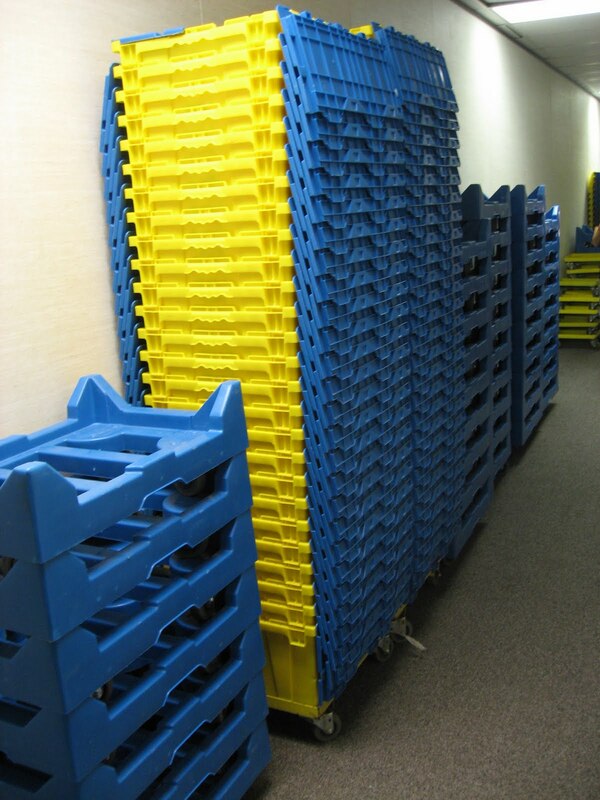 Part of the brilliance of the system, from a workplace safety/risk management perspective, is that no one ever has to lift a full box -- boxes are packed while they're sitting on the rollers, and only empty boxes are ever carried around by staff. 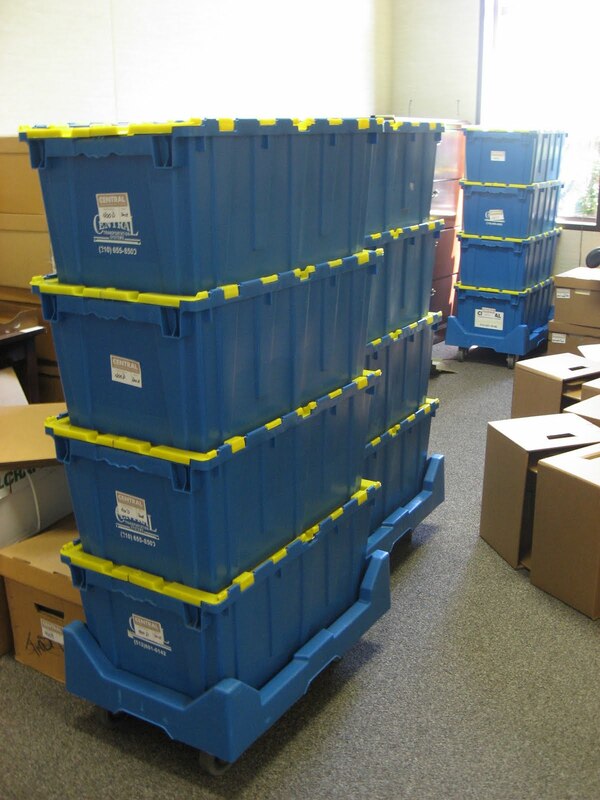 Everything was labeled with color-coded labeled by department so the movers could easily identify which area, and then which specific office, they needed to end up in. And then they simply pushed the bins, with their wheels, onto and off of the trucks. 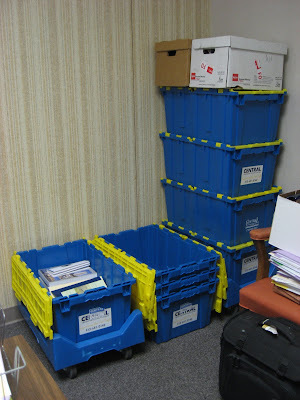 (We had a fair amount of archive materials already in cardboard boxes, so the movers took care of them for us, too, but most things went into the bins.) At the new office, it was relatively painless to unpack everything, removing the empty bins from the tier and condensing them back down into stacks like we first found them. In other green workplace news, the office into which we moved was recently renovated, and every single light is on a motion sensor. It's fantastic. Imagine the extra productivity from not wasting time turning lights on and off. Kidding. But the energy savings are surely significant. And maybe that's what prompted me to institute another green feature at the office: composting. When Steve and I went to the city's (free) composting class last summer, they gave us each a kitchen compost collector. We haven't used them much -- at least not for composting...although they were handy for collecting construction debris that we kept finding as we cleared the yard. (We tend to just put kitchen scraps on a plate or cutting board and take it out once we're finished with a meal.) But when I saw a coffee filter full of grounds in the garbage one day, I realized that I could bring one of the containers to the office and bring home compostables (every Friday) that would otherwise end up in the trash. I sent e-mail explaining how composting works, and I also marked the bin with a helpful cheat sheet of what can and can't be collected. Although I told everyone I wouldn't harass them if they chose not to contribute, I'm getting pretty good participation. In fact, a banana peel and an egg shell were participating as I took that picture. Could that be due to the "Teamwork" post-it on which I wrote the cheat sheet?